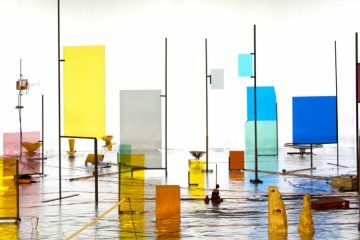 The visual artist Alona Rodeh (1979, Israel) has her distinctive feature in time-based installation, where the sound plays a key role. Her works often entertain the onlooker thanks to their self-performative character and trigger strong physical sensations. What at a first glance could look aggressive or misplacing becomes after a while an enjoyable repetition which inscribes the spectator in spite of himself within a sort of stage. 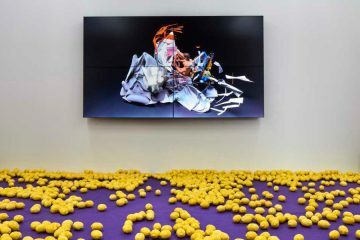 Her interventions call for a new routine inside an exhibiting institution, imposing some new standards and reacting productively to the established habits, safety regulations and other written or unwritten laws of the space. With Barking Dogs don’t Bite (2012) the security and fire system of an emptied art gallery becomes the main character for a sequence of mechanical and inevitable actions activated by the sudden presence of smoke. 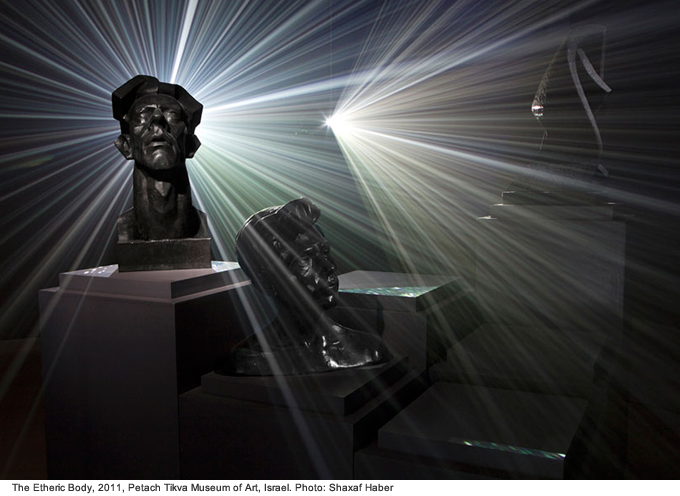 In Rodeh’s last project Neither Day Nor Light (2013), designed for the Helena Rubinstein Pavilion of Contemporary Art in Tel Aviv, the ephemeral transformation of the large basement of the museum in a sort of temple of brightness follows the adaptation for tuba of the Gymnopédie No.1 by Erik Satie. The reflective fabric and the system of lights synchronized with the music give shape to an almost glaring environment in which a majestic curtain appears with all its charge of promises. Up to the moment in which the light-reflection goes off, the space becoming a grey version of the shining one and the curtain a simple line of white strips. The adjustment of the human perception to the changing circumstances, whether disturbing or charming, shapes a different approach of the audience to the space. The same process occurs in Above and Beyond (2013), but following a different script. Here a revisited version of a section of the Wailing Wall in Jerusalem is presented inside a gallery covering the whole space between the two walls and the high ceiling. Smoke and rays of light comes through the cardboard wall, demanding to the eye a further time of adaptation to perceive the shapes. The music composed by Yoni Silver plays here again a pivotal role. Human sounds like whistles and claps are put in constant repetition producing a sort of orientalising composition that matches the hypnotizing effect of the manifestation of the wall. 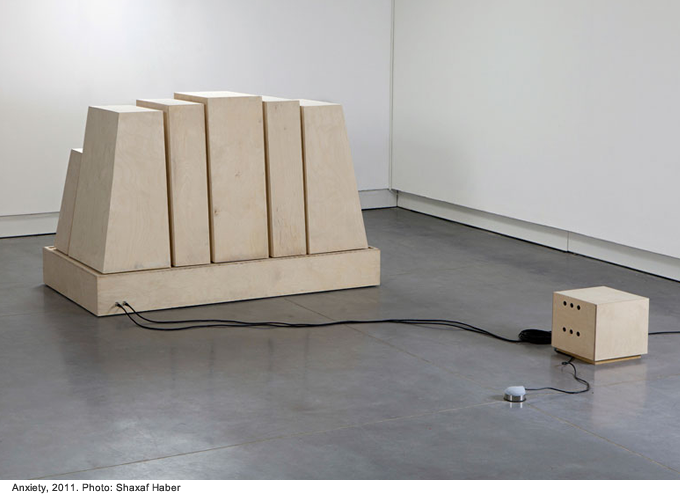 In other works like Anxiety (2011), Black Instrumental Anxiety (2011), and The Resurrection of Dead Masters (2012) the music is concealed inside boxes in the shape of little towers, of a podium or behind a locked door. Through the use of sound shakers the vibrations produced by the music – among others “Muster of Puppets” by Metallica – becomes a call, a shout, a request or a source for uncontrolled abrupt movements. On the boundary between being a shocking encounter and a funny iteration these installations remains an open question to the visitors or passers-by. It seem to ask for attention and reaction and at the same time reject any human collaboration. I met Alona during the preparation for her solo show at Künstlerhaus Bethanien in Berlin, where she lives and works as artist in residency since last September. Here she is currently presenting her new work Safe and Sound. In her words a “post-clubbing” installation, which deals with safety vests, ballrooms, and strategies of attention steering. Mario Margani: Which weight has your background as set designer in your current projects? Alona Rodeh: It’s essential to the understanding of my works. I work more like a director, thinking simultaneously on different mediums: the architecture, the institution, sound, light, and people. So it’s a bit more of a show, an event in time. All these things have to do with “staging”. I take a lot from theatre. When I do theatre I enjoy being in charge on only one of the elements, limited in my contribution to the big act, whereas in my practice as an artist is quite the opposite. 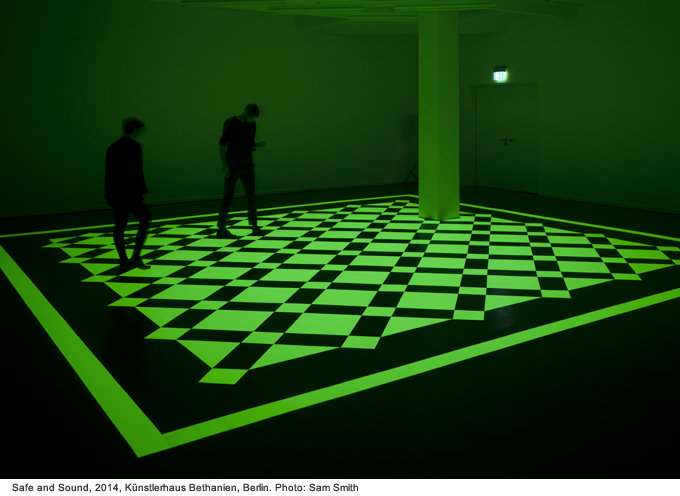 Mario Margani: In your last projects Neither Day Nor Night (2013), Above and Beyond (2013), and also in the installation you are going to realize inside the Künstlerhaus Bethanien – Safe and Sound, the space is transformed through an immersive set up. From your point of view is the audience performing actively inside your installation or is more about experiencing a self-perfomative situation? Do you sort of prepare a set for a play, where the audience is an active character or does the audience resemble a more classic observer position? Alona Rodeh: For sure these works demands a more active position than the normal. Even if you are very passive, that’s the position you chose to take as a visitor. These works are a bit sad without audience, opposed to some painters I know, who don’t enjoy their openings since they feel that massive amount of people kills their works. For me it is a very exciting moment, where everything comes together, everything meaning the people who come to visit as well. My works are not the type that demand actual interaction; the level of activity is dependent on the ones who come to see it: their curiosity, their senses, and the mood they came with. It all can happen with or without them visitors, but it’s always nice to have company! 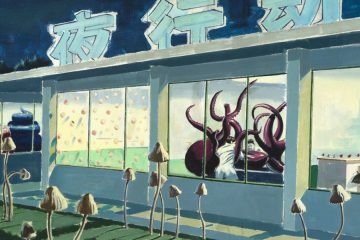 Mario Margani: Recurring elements in some of your works are the curtains, which are also probably related to your background as set designer. Has it also to do with your approach towards exhibition spaces as sort of stages where things do happen? A visitor at first could assume to be either in front or behind the curtain, meaning that he or she is on the stage or opposite to it. Depending on the visitor familiarity with an exhibition space, this effect could be surprising or fall into oblivion. How do you handle with it and with the actual space of a venue where you are called to show something? 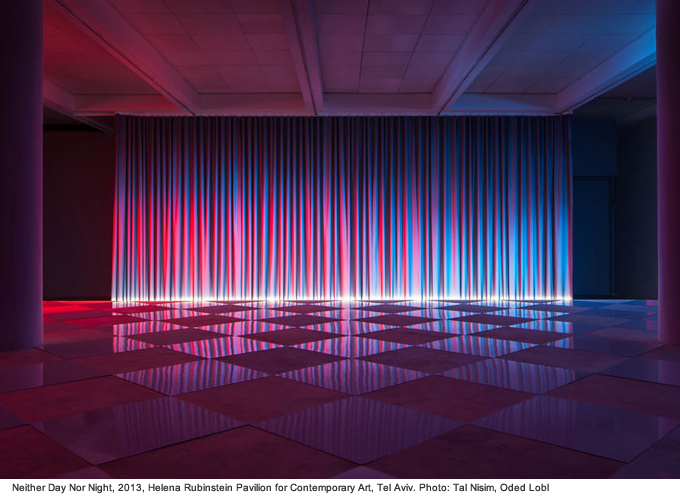 Alona Rodeh: In Neither Day Nor Light the curtain was freestanding. You could see it from all direction and people got that. You could also go through it, and was clearly a stage curtain, only set as landscape, which one could drift in and out of. In Safe and Sound, the setting is more of a dance studio somehow, the curtains are on a practical level of making the sound softer and shutting the light from the outside. One of my main interests is to rethink the space where I exhibit in. People usually visit exhibition spaces not only once. For example, if you have been to Künstlerhaus Bethanien once, probably you have been there a few more times. Usually exhibition spaces are something that people visit on a kind of regular basis and if they do that, they have a clear conception of the space. So for instance you as a visitor remember that the table with books in Bethanien is always on the right of the entrance in front of the stairs. Essentially it is a space that by definition is not tangible. It tries to have as less personality as possible, tries to be as modular as possible. 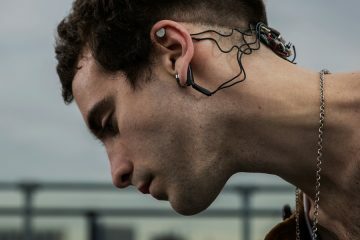 But we still feel that there are some permanent features in it, which are not only connected to the architecture but also to certain habits. We know that there is space that is good for videos and therefore videos usually will be screened in, for example. One of my interests is to recognize these standards and to think how I it can be re-created and re-thought of, with the memory of what it was before. For sure Neither Day Nor Night was about that. The same with Above and Beyond, where the space was shortened of a pair of meters contrasting with the height of the wall. It created disorientation. Also, you suddenly felt the height of the actual space since it was the first time that a work reached the ceiling. In Safe and Sound I was thinking of using the windows on the ground floor of the Bethanien as vitrines calling the street. I chose the second floor for the main install, since it’s the only space in the building with only one entrance, more autonomous. Mario Margani: You have been also invited to interact inside very institutional space as archaeological Museum often are. If I’m a prince and you’re a prince, who will lead the donkeys? (2012) was an intervention inside the Rockefeller Archaeological Museum in Jerusalem. Which was your position towards this kind of museum space and its standards? Alona Rodeh: The core of the work was a sculpture that I brought into the museum. It is a very strange museum: it’s located in east Jerusalem – the Arab side – but it remained an Israeli museum, and was built by the British during their colonialist occupation in the 30’s. So it is a mixture of very different historical moments, a cultural clash. The director is an Israeli Arab, but incredibly a-political. The sculpture I brought in the museum I spotted in the entrance one of the kiosks in my neighbourhood in Tel Aviv. It comes out of a series of waiters sculptures made to hold and show restaurant menus. There are black, British, French figures of typical waiters. This one, as I found out, was the Arab waiter. When I was invited to show in that museum, the curator chose the space for me, it had many figurative sculptures. I put the fiberglass sculpture on a high pedestal, so he would be above the other sculptures, ruling the room. Being quite old and worn out, the sculpture looked pretty much like a remnant itself. So I managed to buy the sculpture from the owner of the kiosk, magically it had exactly the same colour palette as of the painted sculptures and the space. The sculpture was camouflaged in the space. At first glance one wouldn’t notice that it didn’t belong to the collection. Mario Margani: Then it was again about recognising, understanding and playing with the supposed neutral atmosphere of an exhibition space and the standards of a museum. Did you follow the same approach of questioning these rules also for The Etheric Body (2011) at Petach Tikva Museum of Contemporary Art? Alona Rodeh: The Etheric Body and the question of the architecture is a funny one. Back in that time as I was invited to show in this collection gallery, it was a very boring and kind of ugly space, aesthetically speaking. My first intuition was to darken the space, to “delete” it. So the walls were painted dark grey, the sculptural pedestal that I made were grey, and the sculptures I chose from the collection were bronzes and therefore also dark. The installation was only about silhouettes. The choice to avoid the space led the way to the concept of the work. Mario Margani: What kind of sculpture were those you had chosen? Alona Rodeh: The museum collection of Petach Tikva is rooted in a special format existing in Israel. It is a compound, consisting of an art museum and the house of memory for fallen soldiers and other victims. It is a community cultural center combining the elements of life and death, creativity and art on one hand, and remembering the dead on the other hand. And Petach Tikva was the first pioneer of this combination. For this reason they have their objects since the 1930s. Two sculptures I chose were from the 1930s, both called “The Pioneer” but by different artists – Mordechai Gumpel and Yehoshua Yoshpan. A third sculpture I chose was from the 1960s and is called “Yizkor” (“In Memory” literally). One has a blend of soviet and cubistic influence. Another is a portrait of a young and beautiful pioneer, also with Russian spirit. Summing up they represent a mixture of influences, which have nothing to do with a Jewish tradition, although they were the symbols of its revival. I wanted to give a physically perceivable halo, only employing it with light. So the work was about giving these sculptures the cultural background they consciously never had. Mario Margani: Talking about Above and Beyond and the situation in front of the actual Wailing Wall, you mentioned also that your will was to recreate a sort of intimate relation to the Wall as it was many years ago, before of the levelling of the houses which were occupying the space today know as Kotel square. It was actually not possible to dominate the whole Western Wall with the sight from the distance. This implied also a different perception of one’s own body facing a large surface only in the proximity. Today many things happen in Kotel square and thousands of tourists goes by each day. 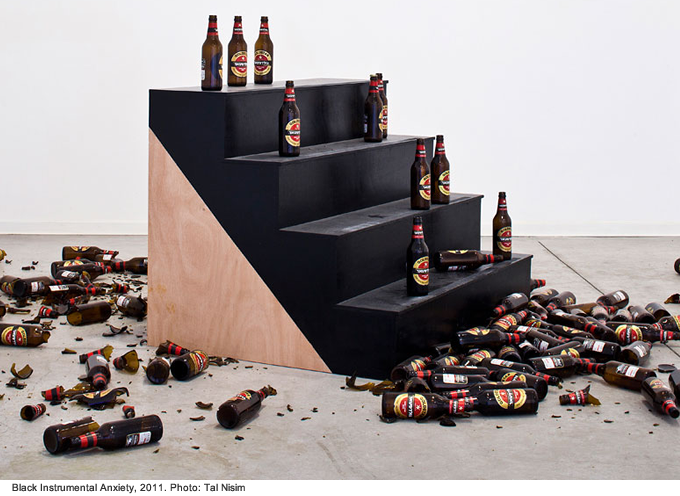 It has also become a kind of playground for visual and figurative impulses under the influence of pop-culture, which are kind of breaking with the Jewish tradition. Alona Rodeh: The Islam found their refuge in the ornament, while Judaism didn’t find any visual comfort within its rules. Till today, it has a very poor visual language. Being a fully text-based religion, the visual was neglected. I find it beautiful, but there has always been a conflict with finding solutions for concrete visual presence within the restrictions. It’s a confusing situation, and I think the Wailing Wall is an amazing example for it: the architecture is so simple, almost random and abstract, but still so iconic in its presence. Mario Margani: In this perspective it seems almost that the Wailing Wall is not functioning as an element defining the outer border of an inner space as the now missing Temple, but more as a background for the Kotel Square. Alona Rodeh: The Wailing Wall is a remnant of the outside wall protecting what was the Jewish Temple. Nearby you have the golden Dome of the Rock and the Church of the Holy Sepulchre. Historically, spiritually, and politically it is one of the most intense compounds in the world. So the question of which side you are on is actually a big question. I see the Wailing Wall as a backdrop. All the boys turning thirteen take a picture praying in front of the wall for their Bar Mitzvah. All the international celebrities who come to Israel are snapped there, being Jewish or not. It’s a set for spiritual, ceremonial and of course political activities. Mario Margani: In Black Eurhythmics (2012) you have been directing a performance of a dancer playing with a microphone and creating a melody out of the sound produced by the lasso-like movement of the microphone itself. Alona Rodeh: I was interested in working with microphone feedbacks through what is called “mic swinging”. There is a long history of feedback usage in sound art, but more on a formal level. Mic swinging is something that sometimes vocalists do when they have nothing else to do, but they close the microphone while they do that, playing tricks. I wanted to merge the two, mic swinging with the sound on. I had an abstract idea, which shaped into form only through rehearsing; we build a specific autarkic sound system for the show. Mario Margani: In Friday (2010), which was a collaborative work, you designed two elements for the space in which a long action with different performers took place. There was a kind of truck wheel with an inner sound system and a podium. How are they related to your further works? 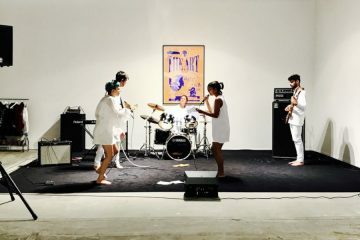 Alona Rodeh: There I worked only on the visual aspect; it was a 4-hour performance, a result of a collaboration with musician Maya Dunietz and Theater director Ariel Efraim Ashbel. The round turning wheel comes from the olive oil culture, turned into a strange speaker-microphone system. The other structure was a sort of abstract stair-pyramid, a stage with sound shakers. That was the first time I used these shakers, and later on they were used in 3 other projects of mine, first Anxiety (2011), which continued the idea of the stairs pyramids. The collaboration itself was a laboratory of intuitive research and complex ideas performed live. Mario Margani: Anxiety (2011), Black Instrumental Anxiety (2011), and The Resurrection of Dead Masters (2012) stimulate weird feelings in the visitors through vibrations and sounds. Transient feelings are triggered. The audience has to take position towards the situation, because in the installation something is happening. You as visitor can’t really change the course of events in any way, although the situation would call you for action. You would like to interact somehow and you are called to do it, but after a while you understand that no, you can’t. Mario Margani: Was The Resurrection of Dead Masters always displayed through the shop window or also inside a gallery? Are the visitors always aware from the beginning of what is going on, or there were also casually passers-by interacting? 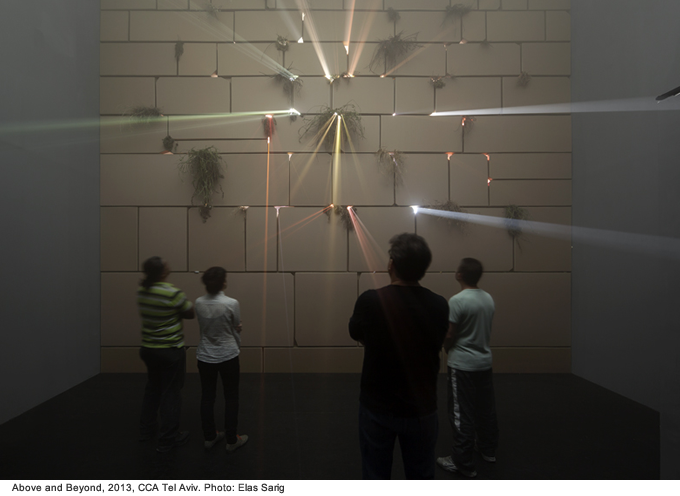 Alona Rodeh: Originally it was created for indoor, a commission by the Israeli Center for Digital Art. Then, next time I showed it, it was an offsite of Plug In ICA, Winnipeg, Canada. Even when I do things out in the streets, I never do it without institutional support. I believe in institutions and in the importance of their work, and at the same time public space is very important to me. In the case of this work, I was fascinated by the fact that when I installed it in it’s offsite version, it was just out there – it didn’t look like art, it didn’t sound like it – you just had to figure out for yourself what is it about. Mario Margani: Which is your approach when your work with “faked”, recreated spaces, such as the Wailing Wall for Above and Beyond? How did the visitors react? Alona Rodeh: The attitude behind re-creating spaces, is to make you put behind your memories from the space, and to see it as if it’s brand new. For example, when a woman goes every day on a blind date, it’s hard for her to keep it fresh and be patient and interested in every date. She starts having these presumptions in her mind of how people are, judging from the statistics till this day. My ambition is to create a new reality, which dazzles you via various hypnotizing effects. Instead of thinking of political issues while being in the space, one can discuss pilgrimage, tourism of religion, symbolism. Mario Margani: An important part in this sort of hypnotizing effect is also related to the sound you used, which plays a key role also in your current installation at Bethanien, although it’s something totally different. Alona Rodeh: Absolutely. In the case of Above and Beyond and Safe and Sound, this effect has also to do with darkness: the image needs time to appear in the eye of the visitor, there is a certain suspension there. It is abstract and concrete at the same time: I was at Above and Beyond with 5-6 year old kids and they immediately recognized that it’s the Wailing Wall. Mario Margani: We have been talking about pilgrimage, holy spaces, and symbols. Your new work Safe and Sound has somehow also to do with a sort of religion such as the clubbing subculture, which has, or maybe had in Berlin one of its meccas. At the same time the floor you shaped as part of the installation resembles the pattern of a church floor or of an old-style ballroom. Alona Rodeh: Yes, I wanted to play with these cross-references. The texture is taken from ballroom floors and church aesthetics, then the colours and the music is related to up-to-date clubbing culture. The idea for this work started before I came here, but then it was natural to develop it here, choosing to work with the German musician and producer Rødhåd for the sounds. The work is about light and darkness and the security elements of the reflective material that belongs to this world of products. It was a subject I was also interested in before but here got more specific. 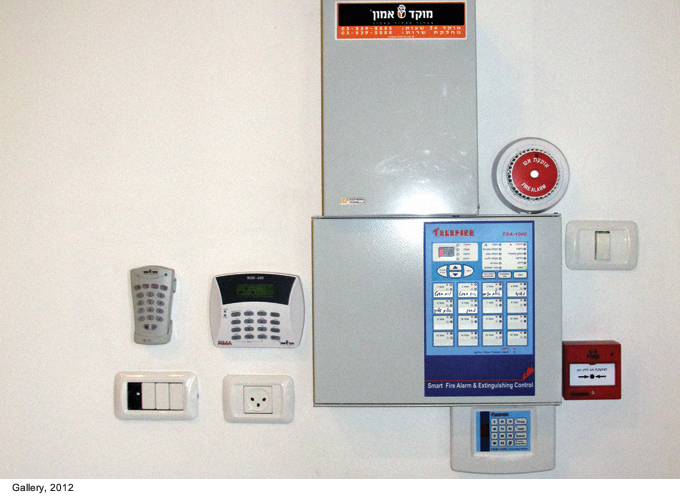 Barking Dogs don’t Bite (2012) is about the security systems of buildings in Israel. Safe and Sound is a combination of the security system of the architecture as it is here in Berlin – which is very different from Israel – and the presence of personal safety: wearing reflective jackets etc. My practice is always heavily influenced by the place I’m living in. I’m not a studio-based artist that needs peace and quiet to work, on the contrary. The idea was to merge the ballroom culture that was flourishing in Berlin before the World War II into the clubbing culture of today. It’s a post-clubbing work… I grew up with the clubbing culture in Israel, which at the beginning of the 2000s was very present, not in a mainstream but in certain circles. What I see happening today is the decline of this culture. I still go out and try to enjoy it. I still find great music in the techno and house scene, but I feel something is wrong. I feel people are just busy with too many things: chatting on their mobile phones while taking a sniff of cocaine, there is too little concentration on the dance floor. Safe and Sound is taking this structure of a dance track and disassembles it bit by bit, presenting it in such a way that one has to listen and observe, because there’s nothing else to do. Mario Margani: The visitors remain just on the border of the floor-piece listening to the music and following light effects and reflections. No clubbing anymore in terms of stepping into the dance floor. It could still be a dance floor, but only to watch and to listen to. Alona Rodeh: The way the lights are directed to the centre is similar to the use that is made of lights in competitive sports like boxing, when only the ring is strongly lit. 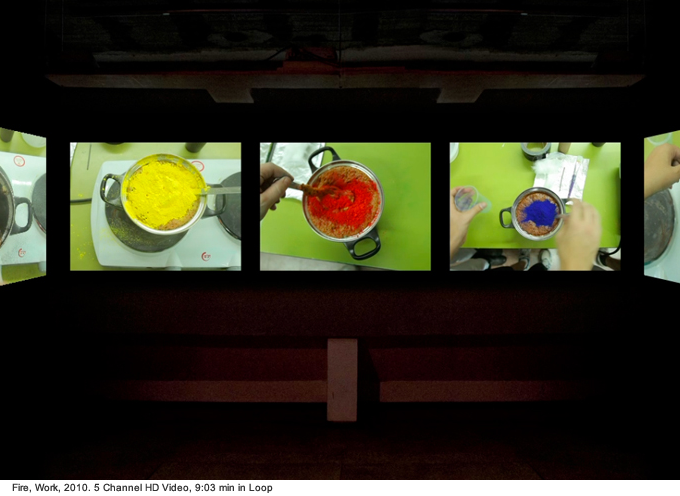 The performance is in and out – as a viewer or as a participant, it’s the same. Mario Margani: Looking at your last projects, you are working with this act of recreating real spaces, not producing one-one replicas, but following a selective process and focusing on some details or effects. 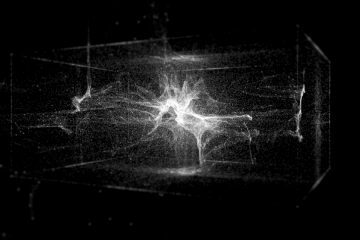 Does your prime focus go on the direct contact and everyday life as a sort of fieldwork or are you approaching the spaces in a more theoretical and detached way? Alona Rodeh: When I’m invited to do a show with a new project, many times the seeds of the ideas derive from the space itself. Then I relate it to something I saw in the street, on the web or anywhere that caught my eye, I capture them and put in my bank of images I find interesting. When the two things come together – the space itself and something I saw, I start digging in with visual research, context etc. It always starts from something I recognized as a cultural phenomenon, many times rather esoteric subcultures. I try to understand cultural occurrences through the observation of the way spaces are used and shaped for specific needs. Mario Margani: Going back to the security systems to be seen in the darkness and the way of directing the attention, you have been also working with self-made smoke bombs and firecracker, as in Fire, Work! (2010). They can convey quite contradictory meanings. They can be employed as a security tool, to signal the presence of somebody requesting help in the distance, but can also be used in order to draw attention in a demonstration, to temporary nullify visual perception, to vandalize a place, or just to have fun. Have you noticed for instance differences in the way people approach smoke or blasts in Berlin and Tel Aviv? Is that related to a different need for security? Alona Rodeh: Yes, there are major differences between the countries. For example, in the US creating your own smoke bomb or buying one is 100% legal and accessible. In Israel it’s strictly prohibited. What happens in Berlin during New Years Eve would never happen in Israel. And it’s all because of the Chinese obsession with firecrackers! On the other hand, Germany has far more regulations concerning safety. Preparing the show at Künstlerhaus Bethanien, I realized that so many things I wanted to do were not possible because of safety regulations. Kindergarten children walk in the streets in groups wearing those safety vests. Through my window watching Kottbusser Damm, I see many demonstrations. Many times it’s small groups of people demonstrating and double amount of Policemen before and after them. So much manpower! Vandalism and security are two sides of the same coin, and I’m interested in both. Mario Margani: Maybe all this has also to do with a different way in dealing with danger, risk or just with human errors of all sorts. The German insurance system is flourishing and you can take out insurance almost against anything. In other countries it’s more about either being reckless or accepting the responsibility sometimes also regardless of what could happen in the worst case. What has been for example the reaction to your intervention with On Fire (2009)? Alona Rodeh: On Fire? is an early work: a balcony with smoke coming out of it. In Israel I would just call the fire department, tell them I’m shooting a movie, and hope that they will remember it in case someone calls them. But I did have fire fighters coming in already… When I exhibited the work in the city centre, it was creating many responses, not all positive – some people were getting stressed out. And when I exhibited it in a more industrial area, it was accepted with apathy, so reactions vary. In many of my works, the border between the accepted and the illegal is not clear, and I’m interested in playing with these issues. 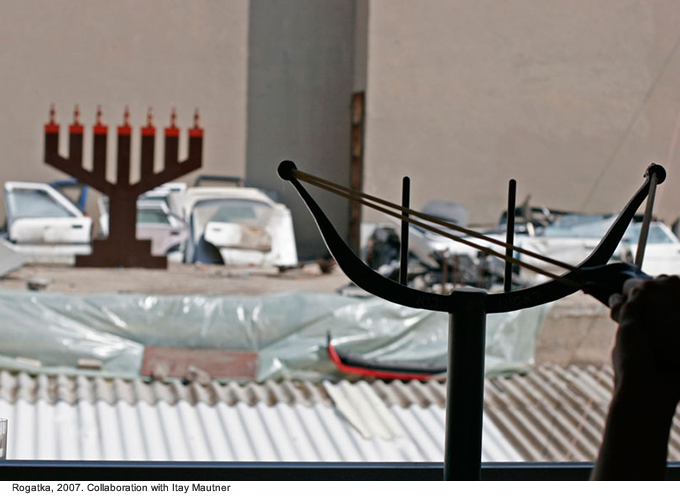 Mario Margani: Moving back to vandalism, in Rogatka (2007) the visitors were invited to play with a slingshot located in a gallery, trying to strike the bottles standing on the branches of an enlarged toy-like version of a menorah on the building next to it. In a past interview you tell the story of you with your friends as kids vandalizing with paint the floor of a place and just enjoying it almost like a game. In Rogatka the visitors kind of vandalized a religious symbol, but they perceived it as game after all. Alona Rodeh: Rogatka is based on the idea that when you are busy with the challenge of the game, you might not notice symbolic relations that exist within the game. Maybe afterwards you might reflect on it. The audience were so focused on playing, they didn’t really think about it. The menorah was designed in the most simplistic way. The extremities of the branches looked like the red ends of matches. The ammunition was chewing gums, so one could chose between chewing the gum or hitting the beer bottles on the Menorah. Mario Margani: Looking aggressive and being harmless. The visitors have to deal with this dynamicity and energy, or even with an initial hostility and boldness in some of your works. But after a while, whether enjoy the work or not, they become used to it and comfortable with it. The adaptation of sight, hear and the feeling of one’s own body in the room take quite an important role throughout all this process. Alona Rodeh: Often, when I participate in group shows, my works physically overshadow others, creating a cloud of sound/smoke/light on the entire exhibition. These works dominate the space, and it’s sometimes uncomfortable for others. Coming from a hot country with such intense political reality, the volume of my works is high, pragmatic and straightforward. I find it important to have my works accessible to wide audiences, non-educated audiences. My works are rooted in the world and therefore they bring themselves back to the world. Mario Margani: In different texts and interviews you talk about the meaning of camouflage, the French original meaning of the word “blowing smoke into one’s face”. I was wondering what is your position about the relation between camouflage and decoration. For example the catalogue to Above and Beyond has this black and white pattern which could be a sort of decoration but also camouflaging, and then in the book there’s the photograph you took of two white vases decorated in a similar way that you found on the street in Jaffa. Do you also feel in your work a connection to non-figurative or sometimes iconoclastic culture? Is that the bridge to your interest in subcultures and vandalism? Alona Rodeh: The main thing I do with camouflage is inherent to the question of architecture. I try to embed my work in the space, as if it has always been there. I do my best to understand where I’m showing, and then I sneak into it, changing the atmosphere of the place without overstating it.